« What word annoys you the most? 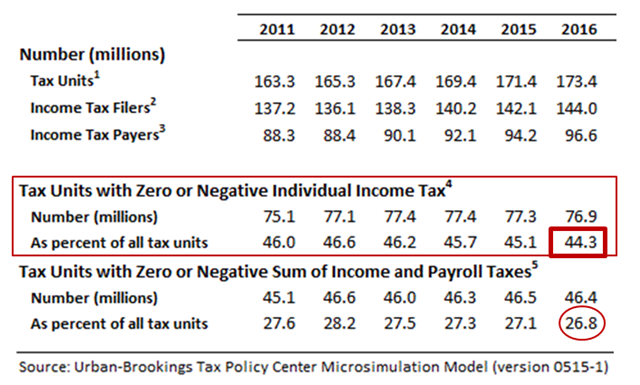 Romney was right on the facts … back in 2012, 46.6% of “tax units” (think: people) paid no Federal income taxes … or paid negative Federal income taxes (i.e. got a check in the mail for “refundable credits”). The improved economy has driven that number down to under 45%. That pushes the percentage of folks not paying Federal income taxes up to close to 48% … 47.8 to be precise. And, the trend will push that number perilously close to the magic 50% majority mark … when folks (think: VOTERS) who pay no income taxes outnumber those who do. “While some may applaud the fact that millions of low- and middle-income families pay no income taxes, there is a threat to the fabric of our democracy when so many Americans are not only disconnected from the costs of government but are net consumers of government benefits. English translation: Things are more rational when everybody has some skin in the game. And, as Mitt intimated: More stuff is a no-brainer if somebody else is paying for it. Almost 60% who pay no Federal income taxes (26.8% / 44.3% = 60.1%) get more than enough in refundable tax credits (i.e. checks in the mail from the IRS) to more than offset any payroll taxes withheld. This entry was posted on December 21, 2017 at 6:59 am and is filed under Employment - Jobs, Tax burden, Tax reform, Taxes. You can follow any responses to this entry through the RSS 2.0 feed. You can leave a response, or trackback from your own site. Prof Homa, I think lefties argue that the poor pay sales tax and other regressive taxes and fund government in that way.